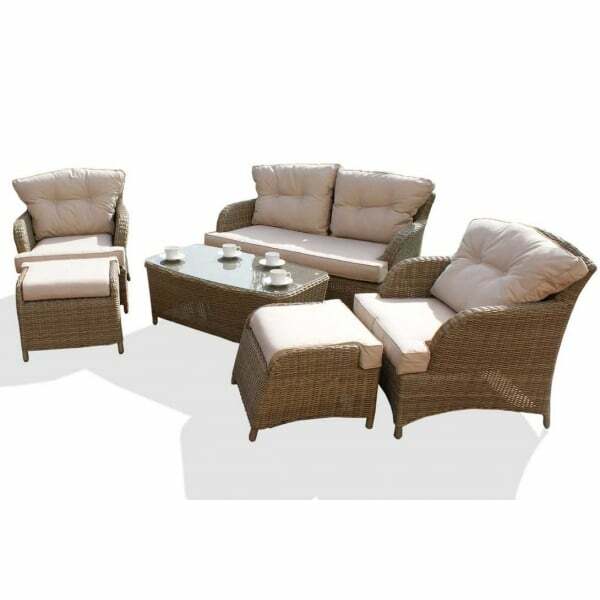 This attractive sofa set from the Winchester range features a synthetic round rattan weave in natural tones and is a the perfect addition to your garden, patio or conservatory. The sofa set features 2 chairs and a 2 seater sofa with padded seat and back cushions for extra comfort and support. The two versatile matching footstools complete with padded cushions, can be used when relaxing or to provide additional seating when entertaining family or friends. This elegant sofa set can be enjoyed either indoors or outdoors in the garden. The weatherproof rattan is easy to clean using warm water and a mild detergent ot remove stains. Simply store the cushions indoors during the winter months. The set includes a 1 year manufacturer's warranty. Other complimentary products from the Winchester range can be viewed on our site. The delivery schedules quoted on our product pages are Working Days and intended as a guide only. Schedules are based on our experience of what is the approximate AVERAGE delivery period of the relevant supplier. For more information please see Terms and Conditions of supply with particular reference to: SECTION 4 and 5. Where Products of below £50.00 in value are shown as having Free Delivery this means when aggregated with other products to achieve minimum order value of £50.00. The price you see in the shopping basket after you have entered your postcode is the price that you will pay, all prices are inclusive of VAT. *Product Ranges Such as the Fencing, Live Plants and some Pots are subject to a Pallet Delivery System with a one off charge of £40 regardless of number of items in same range ordered. Please assume that delivery of larger Items examples including Sheds, Summerhouses, Log Cabins, Greenhouses, Garden Structures, Garden Furniture, Large BBQ's etc. is to Kerb Side. Customers are advised not to assist with off-loading. Many Delivery Drivers (but not all) will help to move items beyond the kerb but at Kerb Side goods become your responsibility. If the product you have purchased has an assembly option and you choose to take this assembly service then the delivery and assembly will not usually take place on the same date. The independent assembly company will endevour to complete the assembly within 7 working days of delivery. It is very important that all parts are checked and verified before the independent assembly company arrives to carry out the work as failure to do so could result in unnecessary delays once the company arrives. In the unlikely event that you wish to return your product any unopened non-faulty items returned by you to our premises or address of our choosing complete with packaging, manuals / instructions and any fixings within 14 days (7 Days in the case of Timber or Stone Products) of purchase may obtain a full refund. If it is required that we collect there will be a carriage cost. The Company accepts no responsibility for any consequential loss caused to the buyer for the receiving by us our our agents of faulty goods i.e. please insure goods that are returned to us as the liability for goods whilst in transit is yours. Please Note Any Trading on this Website is in accordance with the Consumers Cancellation Rights for Distance Selling 2000.